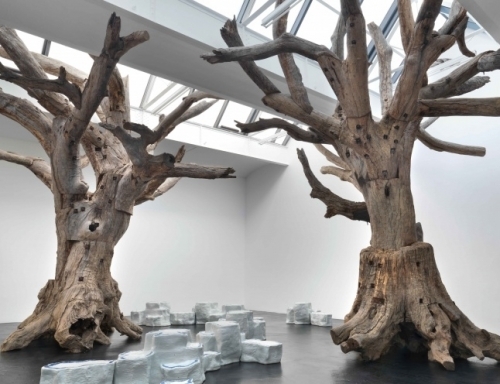 Born in Beijing in 1957, Ai Weiwei is an artist and an activist. His father, Ai Qing, a poet and prominent intellectual, was proclaimed an enemy of the people under Mao Zedong’s regime, and the family was exiled to a labor camp when he was one year old. Only in 1976 were they allowed back in Beijing and his father was fully rehabilitated. Ai Weiwei began his career on the burgeoning art scene of Beijing, taking part in exhibitions and artists’ acts of protest against the government and calling for artistic – and general – freedom. Seizing the first opportunity to leave China, Ai arrived in the United States in 1981, eventually settling in New York where he lived for ten years, drawing inspiration from Marcel Duchamp and Andy Warhol and consolidating his artistic standing. Returning in 1993 to China to care for his ailing father, Ai became involved with the early Chinese avant-garde, organizing exhibitions and publishing underground books. In 1999 he began his architecture practice by designing and building his studio house in Caochangdi, Beijing. In 2006 he started blogging on the internet, becoming a popular and unfiltered voice on political, aesthetic, and societal concerns. Today, thanks to his formidable talent and ability to create human connections, Ai Weiwei is a hugely influential figure in China and one of the most important artists of our time. Ai’s works are typically massive in scale and awe-inspiring in the virtuosity they exhibit, often requiring the assistance of dozens and sometimes even hundreds of highly skilled craftsmen and craftswomen. What seems attractive at first glance reveals itself on closer scrutiny to be more complex and less pleasing, alluding to subjects such as labor and working conditions, the eradication of tradition in the name of development, censorship, migration and displacement and Chinese history – recent and distant. He famously rallied his studio and hundreds of volunteers to call for the investigation of the casualties of the 2008 Sichuan earthquake, in particular children whose schools, poorly built as a result of corruption, had collapsed in the quake. Focusing on the use of excessive force by the state and the threat against the freedom of expression, Ai aims the arrows of his criticism at injustices – overt or covert – all over the world. In 2011, in retaliation for his activism, Ai was arrested and secretly imprisoned without trial. When he was released 81 days later, severe restrictions were imposed on him and his studio was placed under surveillance.